Have you ever wondered how the tooth fairy tradition started? In The World’s First Tooth Fairy….Ever we find out! Have you ever wondered how the tooth fairy tradition started? Join Abella, a precocious little fairy on her journey through Tulip Hollow with her friend Darcie. Abella finally has the chance to venture out of the castle and fly to a party with Darcie when she is snatched by a big old bee and flown out of Tulip Hollow. Find out how Abella frees herself from the bee and discovers children for the first time. Follow along as she shows great courage and resourcefulness to solve an unexpected problem and return home to Tulip Hollow. It is during this challenge that Abella accidentally starts the tooth fairy tradition. The World’s First Tooth Fairy… Ever is a delightful book about adventure, bravery and how being curious is often a very good thing. As parents, how many times have you been asked about the tooth fairy? Where did the tooth fairy come from? Why does she take our teeth? What does she do with them? I am sure I am not alone in saying, my kids stump me when they ask these questions. I am not really sure what to tell them about how the tooth fairy began her task of collecting the children of the world’s teeth and leaving them a token of surprise in exchange. 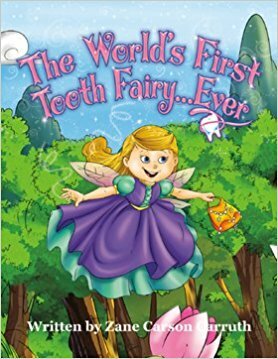 The World’s First Tooth Fairy….Ever helps you to explain the legend of the tooth fairy in a fun and exciting new way. In this book, we have sweet Abella who longs to explore the world but her parents are cautious and don’t want her to leave the walls of their home. Fair enough – the world is tough when you’re the size of a fairy! She finally convinces them to let her out on an adventure to a party with her best friend with very strict instructions. Which she follows but a big grumpy bee catches her on her way and puts her completely off her path! We had quite a few giggles at this point in the book especially with how Abella escapes the bee. While she escapes the bee, she is now in a world that she does not know, her dress is ruined, she has lost her pearl and feeling sad. She comes upon two children – one of whom has just lost a tooth. The tooth reminds her of her lost pearl and voila! An idea of how she can solve her problem and make it home to her parents is born. Not to mention the legend of the tooth fairy but you have to read the story to find all the exact details as the first tooth fairy encounter doesn’t go quite as expected! This was a precious book that was fun to read out loud to my son. Zane puts a clever take on words and the story flows so nicely which is a must for children’s books. It was both silly and serious which allowed us to have fun reading it. The tooth fairy legend blossoms out of her adventure in such a unique way that we were not expecting. The illustrations are beautiful and suit the story and Abella’s character. Abella is full of courage and determination. She never gives up hope in any part of the book even when she was feeling alone and discouraged. She would just get right back up and figure out how to solve the problem she was in (which is such an important message for children). This is a special book that will make a great addition to your home library and perfect for bedtime reading. You can purchase a copy of this book on Amazon. Zane and her husband Brady reside in Houston, Texas. She is actively involved in the Houston Grand Opera, Houston SPCA and the Discovery Green Conservancy. In addition to owning Carson Marketing, LLC, Ms. Carruth is a certified etiquette professional and has published articles in several high-profile magazines. Both she and her husband are avid thoroughbred horse racing enthusiasts. When not traveling, she cherishes spending time with her 3 grandchildren, Chloe, Carson and Truett. Ms. Carruth has recently completed her second hardback book going to publication next week. 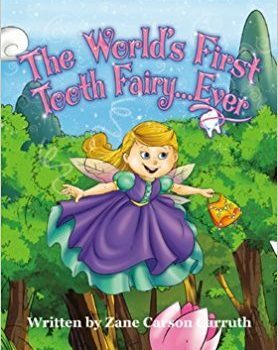 The World’s First Tooth Fairy…Ever Presents: The Adventures of Abella and Her Magic Wand. After years of fantasizing and months of studying, Abella finally receives her magic wand. This precocious little fairy vows to take the responsibility of wand ownership seriously and all the power that comes with it. It is a delightful book about facing challenges and accepting responsibility – even when you make mistakes. Luckily for Abella, her best friend Darcie, is with her every step of the way, doing what best friends do best. You can connect with her on her websites: Carson Marketing, Etiquette to Excel and World’s First Tooth Fairy. Disclosure: I received a copy of this book. All opinions expressed are my own.